Tour Israel with Dr. Steve Ayers and Dr. Tony Crisp! Mail your registration with full payment today! Dr. Steve Ayers is the lead pastor at Hillvue Heights Church in Bowling Green, KY.
Dr. Tony Crisp, PhD, is the President of TLC Holyland Tours. Experience the trip of a lifetime for 11 days in Israel! Pricing and itinerary based on proposed flight schedules. Itinerary may change once flights are booked. *(**price is based on double occupancy in a twin-bedded room and economy class seating. Price does NOT include $175 Trip Tips and an estimated $705 Airport departure tax/fuel surcharge) Balance for all due in full by Oct. 27, 2018. Single Room Supplement is additional $700. Round trip airfare from Nashville (BNA) to Tel Aviv (TLV) via Newark (EWR) on United Airlines. **All accommodations are based on HB. (HB is half board and includes full Israeli breakfast and set menu dinners in the evenings. There is an extra charge for coffee, tea or other beverages not included in the menu of the day.) Also includes fish lunch in Galilee and farewell dinner. Eight (8) full days of sightseeing in the most modern, deluxe, air conditioned coach bus available with services of a top-class Government Licensed Guide. One free day while in Jerusalem! 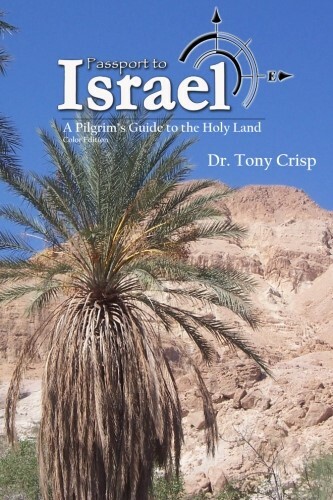 From Dr. Tony Crisp comes an invaluable resource with full color photographs for anyone traveling to Israel! A deposit of $500 (per passenger) is required at the time of registration to hold a space, and may be paid by credit card on our website via PayPal. $175 is nonrefundable for any reason. Payment schedule is listed on the brochure. Click on link below. The balance is due in full by Oct. 27, 2018. Please read cancellation penalties and dates on page 4 of the brochure. A scan of your passport photo page must be submitted by Oct. 27, 2018. Wed., Jan. 30, 2019: Today you will leave the United States on a trans-continental flight to Tel Aviv, Israel. Your flight departs late in the afternoon and arrives in Israel in the morning of the next day. This morning you will have an early check-out from your hotel and leave the beautiful Sea of Galilee, following alongside the Gilboa mountain range. At Harrod’s Springs you will see where Judge Gideon tested his men before the battle with the Midianites in the valley between Gilboa and Mt. Moreh. From there you will visit the last site before your journey down the Jordan Valley, Bet Shan. While not mentioned in the New Testament, it is an Old Testament city and the best preserved Roman city from that period in Israel today. You will have lunch, a break and then begin to descend toward the Plains of Jericho as you head to Qumran , the center of the Essenes. Qumran is home of the ancient caves where the Dead Sea Scrolls were found. From there, you will continue south to your beautiful hotel , the David Dead Sea Spa and Resort, where you may float in the waters of the Dead Sea, the lowest spot on earth, if you desire. Today you will go on to the mighty fortress Masada, the last stronghold and stand of the zealots against Rome, on the edge of the barren Negev Desert. Masada is a symbol of courage and perseverance for the Jewish people, where 960 Jewish defenders organized their last resistance to the roman conquerors and took their own lives rather than surrender into slavery. From there, you will continue northward in the desert where ibex roam at Ein Gedi, David’s hideout from Saul. Time permitting, you will stop at Wadi Qelt to overlook the barren Judean wilderness and the Valley of the Shadow of Death. After passing by ancient Jericho the climb to Jerusalem begins while viewing scenery and traveling the same route the ancient pilgrims would have taken as they made their journey to Jerusalem for the great feasts of Israel. Today you finally arrive in the City of God, the City of David and the ancient and modern capital of Israel, Jerusalem. Your heart will leap with emotion as you stand on the overlooks of the Mount of Olives and see the breathtaking Mountain of Moriah. It is there where Abraham was to offer Isaac, Solomon built the first temple, and where Jesus walked, taught, died, rose again and will one day return in great glory! This is only the beginning. You check into your hotel, have dinner and enjoy the first of five nights in your lovely hotel in Jerusalem. Tues.-Fri., Feb. 5-8: Jerusalem, Jerusalem, Jerusalem! You will complete your tour of Israel on the last afternoon, at Calvary and the Garden Tomb. After that awesome experience you share a sumptuous Farewell Dinner before returning to your hotel for your last overnight in Jerusalem, the City of God. After a very early morning checkout, you depart for Tel Aviv for your flight to the US. With memories that will last for a lifetime and with plans to return and bring others back to experience God’s Holy Land – Israel! Blessed traveling from all of us at TLC Holyland Tours!